The Francophone Caribbean and the American South are sites born of the plantation, the common matrix for the diverse nations and territories of the circum-Caribbean. This book takes as its premise that the basic configuration of the plantation, in terms of its physical layout and the social relations it created, was largely the same in the Caribbean and the American South. 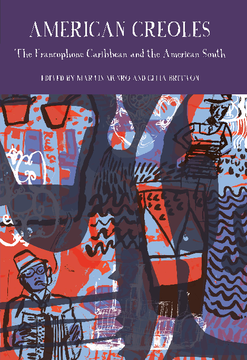 Essays written by leading authorities in the field examine the cultural, social, and historical affinities between the Francophone Caribbean and the American South, including Louisiana, which among the Southern states has had a quite particular attachment to France and the Francophone world. The essays focus on issues of history, language, politics and culture in various forms, notably literature, music and theatre. Considering figures as diverse as Barack Obama, Frantz Fanon, Miles Davis, James Brown, Edouard Glissant, William Faulkner, Maryse Condé and Lafcadio Hearn, the essays explore in innovative ways the notions of creole culture and creolization, terms rooted in and indicative of contact between European and African people and cultures in the Americas, and which are promoted here as some of the most productive ways for conceiving of the circum-Caribbean as a cultural and historical entity. An Open Access edition of this work is available on the OAPEN Library. Examines the cultural, social, and historical affinities between the Francophone Caribbean and the American South. Considers figures as diverse as Barack Obama, Frantz Fanon, Miles Davis, James Brown, Edouard Glissant, William Faulkner, Maryse Condé and Lafcadio Hearn. Martin Munro is Professor of French and Francophone Studies at Florida State University, and the author of Different Drummers: Rhythm and Race in the Americas (University of California Press, 2010); Exile and Post-1946 Haitian Literature: Alexis, Depestre, Ollivier, Laferrière, Danticat (Liverpool University Press, 2007); and editor of Haiti Rising: Haitian History, Culture and the Earthquake of 2010 (Liverpool University Press, 2010).